Assam drew with defending champions Karnataka, beat former back-to-back winners Rajasthan by an innings, toppled Haryana at home in Lahli and are now on the cusp of beating Delhi. Ninety-five runs separate the newly-promoted team from registering their third win in six matches and consolidate their place at the top half of the Ranji Trophy points table in Group B. They still have seven wickets in hand, with opener Rahul Hazarika and KB Arun Karthik are at the crease in the final innings in Guwahati. Much of their position has been down to the bowlers who dismissed Delhi for totals under 200 both times. Spinners Amit Verma and J Syed Mohammad took six wickets between them. Unmukt Chand made 44 yesterday and that remained the top-score of the innings. Pulkit Narang tried to delay the inevitable with 26 off 133 balls and remained not out even as Delhi were all out for 172. Haryana crumpled to 216 all out in their first innings, which well short of Odisha's 529 for 6 declared and were made to follow-on in Lahli. Seamers Basant Mohanty and Suryakant Pradhan picked up three wickets each whilst the only substantial resistance came from opener Nitin Saini and his 51 off 146 balls. Haryana, resuming on 38 for 0, were bundled out soon after tea. Although there wasn't a startling collapse, none of the batsmen could put up a substantial score. Besides Saini, Jayant Yadav made 46 but the remaining eight batsmen could not push past 30. A definite problem when there is a batsman among the opposition who made 255. Natraj Behera, the Odisha captain, appears all but certain to have helped his team to their second win of the season. 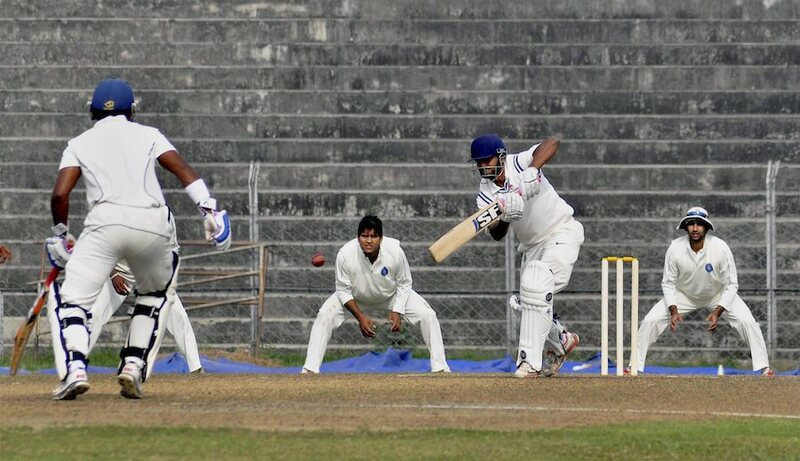 Aditya Sarwate struck a combative fifty from No. 8 and then nipped out four wickets to keep Vidarbha's hopes of an outright win. The match had been petering towards a draw with Rajasthan on 150 for 2 when he, Akshay Wakhare and Ravi Jangid orchestrated a collapse. Seven wickets fell for 69 runs and Rajasthan ended the day on 226 for 9, leading by 195 with one day left to play in Nagpur. Ashok Menaria and Vineet Saxena had picked up a half-century each during a 110-run partnership for the third wicket, but as soon as it was broken, Rajasthan's stability was lost. Jangid provided those vital wickets, having both men caught by Wasim Jaffer for 76 and 54 runs respectively. That opening was enough for Sarwate who got rid of Rajat Bhatia for 3 and then ran through the tail to finish the day on 4 for 58. Maharashtra made a solid reply to Bengal, who had declared overnight at 528 for 8, with Rahul Tripathi's third first-class century. He was unbeaten on 116 at stumps in Pune with Ankit Bawne on 59 not out keeping him good company. The hosts had put on 296 runs on the board, but were still 232 runs behind. An early wicket is not what teams going in to bat after conceding 500 runs want, but Maharashtra had to contend with opener Harshad Khadiwale falling for only 5. But his partner Swapnil Gugale made 35 off 68 balls after which Sangram Atitkar breezed to 69 off 118 balls as Maharashtra recovered nicely and gave themselves an outside chance of taking a first-innings lead.